To date, there have been nine models of the StuIG 33 produced, ostensibly in 1/72nd scale. The first was the very old resin conversion by Commander Series, which is long out of production. This was followed by complete resin kits from Rhino and VVV, and a conversion from Al.By, all also now out of production. Another complete resin kit appeared around 2001-2002 from TP Models. Two more conversion sets hit the shelves in 2003, from ModellTrans and AMC, and in 2004 we were provided with a complete plastic kit from Attack Models. 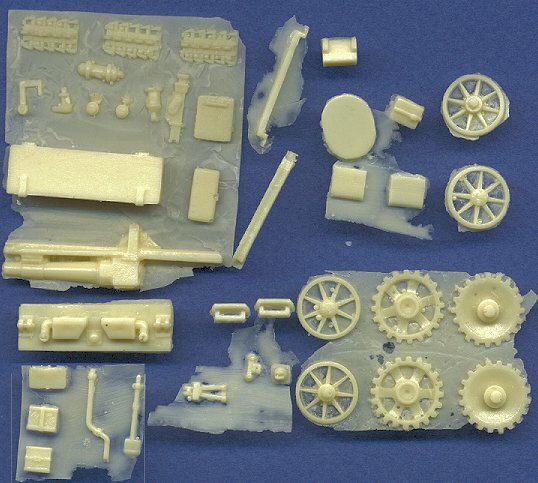 After a long, seven year span, we were finally given another alternative in plastic, this time a limited-run kit from Military Wheels. 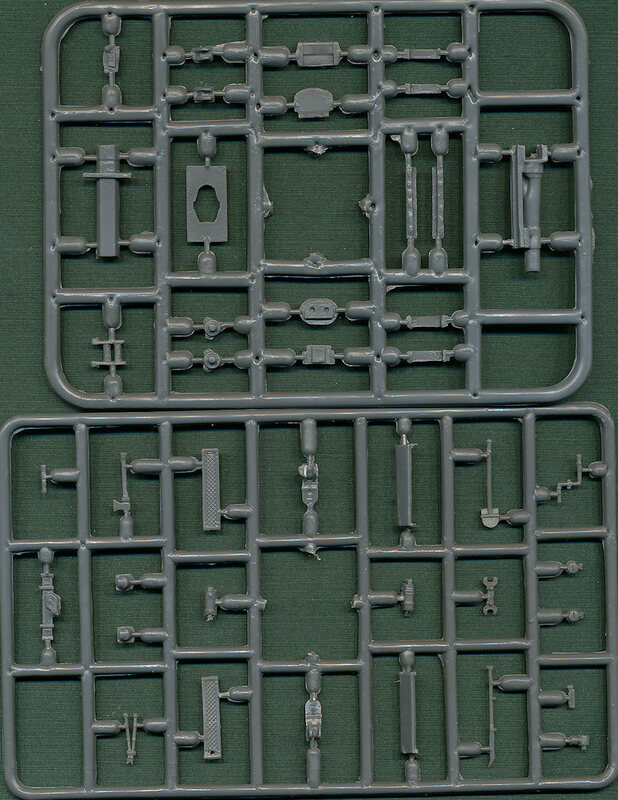 The StuIG 33 kits are presented in the following table, with the column titled "Origin" referring to the source kit that was converted to make the resin model. TP Models Resin Complete kit Original? VVV Resin Complete kit Fujimi? Before I present the individual kit reviews, I want to quickly point out a couple of items that show great variation between the reviewed kits. 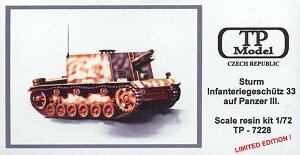 First, most of the resin kits were created by converting either the old ESCI Stug III/Panzer III kits into the StuIG 33, or by converting the new Revell Panzer III kit. Consequently, the newer StuIG kits that were based on the Revell model have much finer detail on their fenders and engine deck than do the kits based on the ESCI models, which had somewhat crude detail. Another variation in the kits is the superstructure roof. The roof is very plain, with only three items on it to break up its flat expanse. First of all, the crew hatch in the left rear corner. This is a small, rectangular hatch that sits flush with the roof when closed. Some kits present this hatch with a substantial thickness sitting higher than the level of the roof, which is incorrect. Second, the gunsight that projects out from an opening in the roof has an armored plate standing above it to protect the opening in the hull armor. This armored cover is an oval shape, set on a diagonal. Some kits incorrectly depict this plate as a perfect square. Finally, there is a small ventilator cover, set adjacent to the gunsight cover. The size, shape and location of these three items are variable between many of the kits. There is also applique armor plates added to the nose and glacis plates. This is a feature lacking in many of the kits described below. Below I provide short previews of each kit in alphabetical order, not by preference. Note that my collection is missing two of the rarest kits: the Al.By kit and the VVV kit, so I have not seen these two kits in-hand. I do not own this kit, but you can see a preview of it here, which was sent in several years ago by George Buzby. 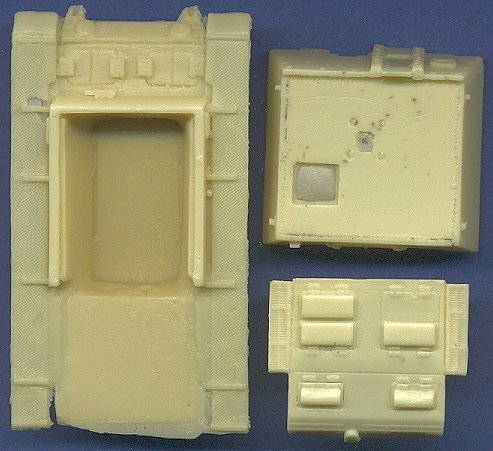 This model can be found in two forms, either as a simple conversion set, with only the resin parts seen in the preview, or as a combi-kit, which pairs the resin conversion set with a plastic Stug.III kit from ESCI. Since Al.By has a very limited production capacity at the moment, one would be lucky to find one of these kits. Till Huber used this kit to make his superb Stalingrad Diorama, and you can see more details of the completed model in the several views provided by Till. This conversion consists of an upper hull that completely replaces the hull in the ESCI kit, which is needed to complete the conversion. The new hull was modified from an ESCI Stug, which means that the detail on the fenders and the engine deck is not quite as fine as on the new parts. The engine deck was not modified from the ESCI kit, and so it incorrectly represents the F/8 pattern, with the late style of engine vent arrangement. 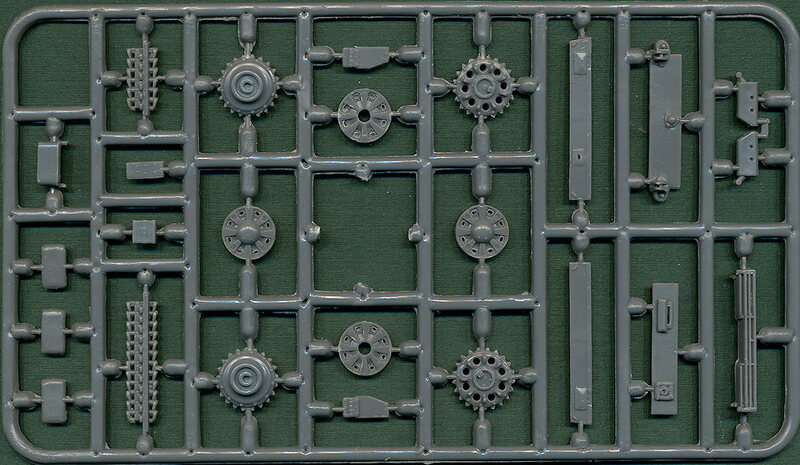 The front transmission access hatches are the later, small-hinge style, unchanged from the ESCI kit. It doesn't appear as though this kit includes the armored plate for the lower glacis. The new superstructure looks masterfully done, as is typical with most of Al.By's kits. The rooftop details are correctly represented, and the rear crew hatches are also done right. All of the other details, such as the gun, the detailed front of the superstructure, the engine deck storage box, also look very well made. If it wasn't for the problem of using the ESCI kit as the base model (because this is an old conversion), and not changing the engine deck to the early pattern, this would likely have been one of the best conversions reviewed here. This is one of two kits reviewed here that is based on the new Panzer III kit from Revell. Unfortunately, it is hampered by poor research, and has some serious accuracy problems. 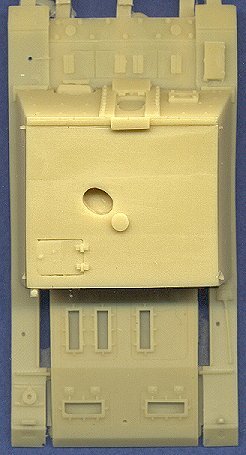 The engine deck has been changed from the F/8 style of the Revell kit, to the earlier layout. I find this interesting because there are so many accuracy errors with this kit, it is strange that they got this detail correct. The glacis plate access hatches have been altered from the original, and they now represent something completely fictitious. They resemble the hatches that appeared on some late versions of the Panzer III, and are completely incorrect for the StuIG. This kit does not include the armored plate for the lower glacis. The crew hatches on the rear of the fighting compartment are incorrectly represented as a single, double-door hatch in the center of the rear wall. The rooftop is also completely wrong. The commander's hatch is incorrectly standing above the level of the rooftop, when in fact it should sit flush with the upper plate when closed. It is also placed in the wrong location. There is no ventilator present, and the cover for the gunsight is incorrectly provided as a square. On the front face of the fighting compartment, the machinegun mount is too small, and located too high and too far to the left. The bolts for the armored plating are not pronounced enough, and the strips of armor plating to the sides of the main gun opening are too narrow. All in all, not a good representation of the real item. Considering all of these inaccuracies, this is why I said above that it is interesting that AMC actually changed the engine deck to accurately represent the early style. Another indication of the poor research AMC did for this model is the painting and marking guide included in the instruction sheet (which is a line drawing showing approximate placement of the kit parts), where they show the vehicle numbered "64" when in fact it should be "G4". And finally, I am not very impressed with AMC's quality control, since the model I own is actually incomplete, and is missing several of the small parts. 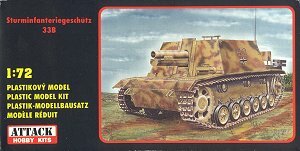 This was the first plastic kit made available of the StuIG 33, and it is a complete kit very similar to their earlier Stug III series. It is a limited-run model. This kit seems to be based on the Stug III Ausf. E, with the engine deck appropriate for that version. Overall vehicle dimensions are good, though the fighting compartment is a bit small, being a little bit too short in both height and length. 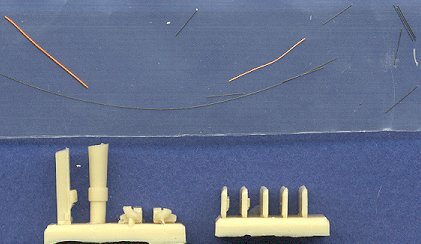 The length discrepancy can be easily fixed by adding some sheet styrene to either the front or rear face of the fighting compartment. It's also possible to add a layer of plastic to the roof as well, though you will need to recreate the small amount of detail that is up there. Unique to the kits in this review, the Attack model comes with a small fret of photoetched parts, which is a really nice touch. These parts include the gunsight cover for the roof, rear crew hatches and some lift hooks. 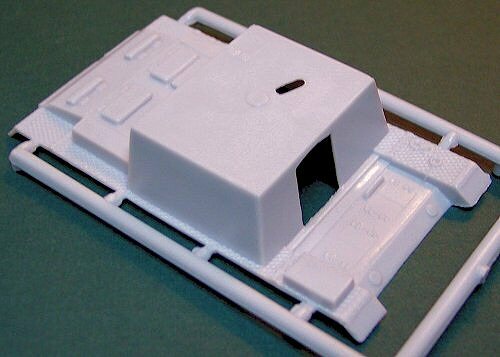 This kit will allow you to easily pose open the upper crew hatch, since the plastic roof is fairly thin, and the hatch (which is molded shut) can easily be cut open. 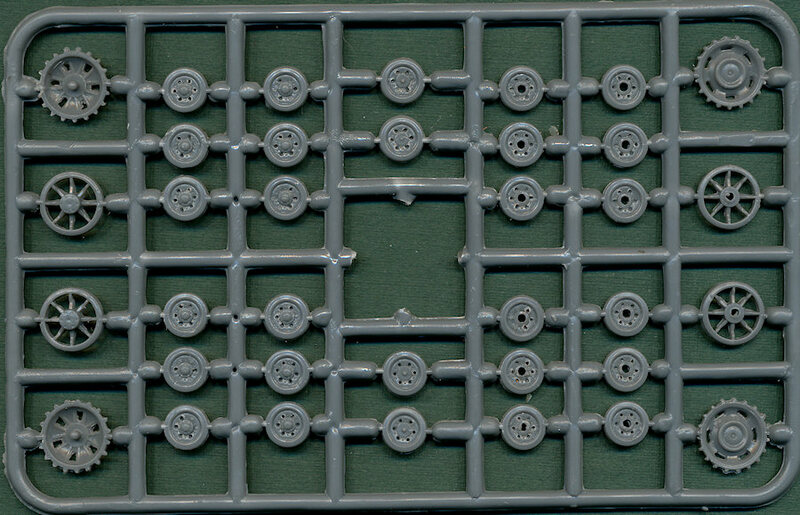 The rear wall of the fighting compartment is molded solid, but since the crew hatches are provided as separate brass parts, it would be an easy task to cut openings in the plastic hull for opening these hatches as well. 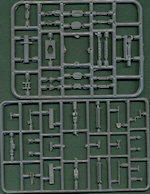 While this task would also be possible on the resin kits, that would be a much more time consuming, and messy, project. Detail on this kit is a little soft, as it is for many limited-run models. The tools molded onto the fenders can be removed and replaced with more realistic items. 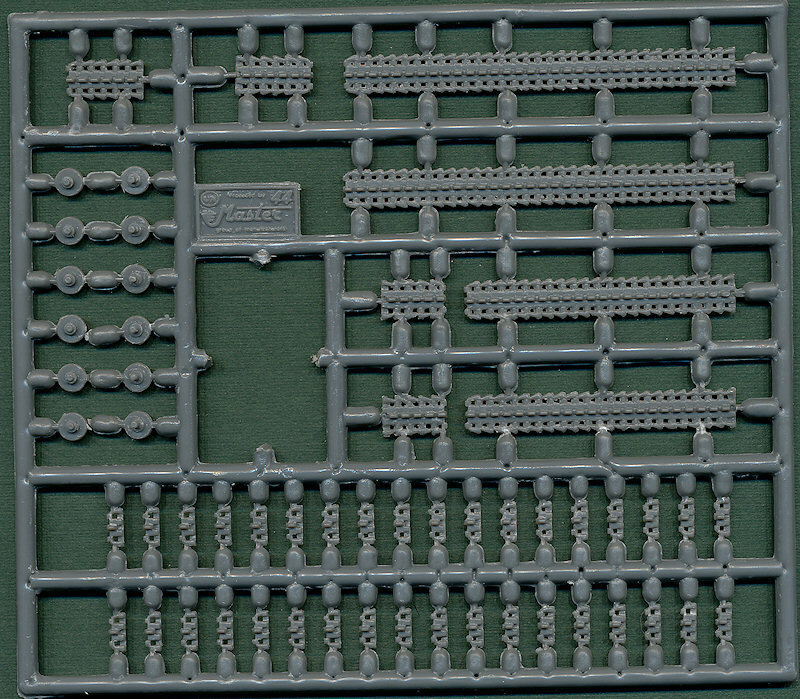 Bolt detail on the front face of the fighting compartment can also be replaced with larger and more clearly made bolts. 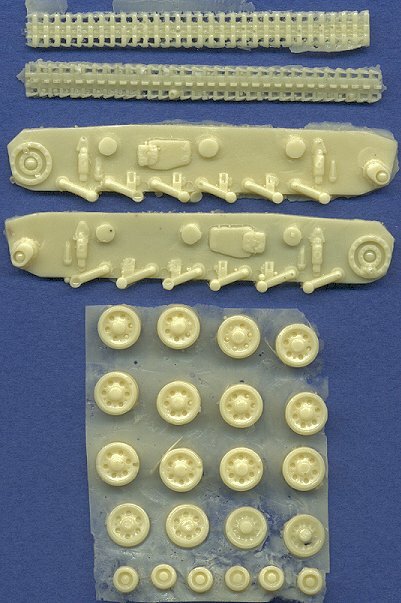 Markings are included for one of two vehicles: the first is a set of crosses for a gray vehicle of Stug. Battalion 177 in 1942 (first batch in Stalingrad); the second is the same set of crosses plus vehicle numbers (G2). The rear of the box states that these markings are for Stug. Battalion 177 in 1943, which is incorrect, since this unit was lost in Stalingrad. But the instructions contradict what the box art indicates, and state that these markings are from the Lehr Battalion XVII in 1943. I believe that they are actually for Panzer Regiment 201 in the 23rd Panzer Division, but unfortunately, no division or regiment markings are included. Instructions are nicely drawn and clear. The Attack kit is not bad by any means; built straight from the box, it will make a fairly decent model, but adding a little bit of extra effort will make it look really quite good. Out of the box, this is one of the most accurate kits in this review. I believe that this was the first StuIG 33 kit available in this scale, and unfortunately, due to its age (and likely the fact that it was based on old drawings), it is one of the least accurate kits in this review. 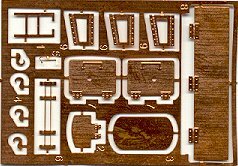 It is not a complete kit, and includes only the one-piece hull, the gun, and the engine deck storage box. It was based on the ESCI Stug III kit, and hence shares the same fender problems as all the others so based. 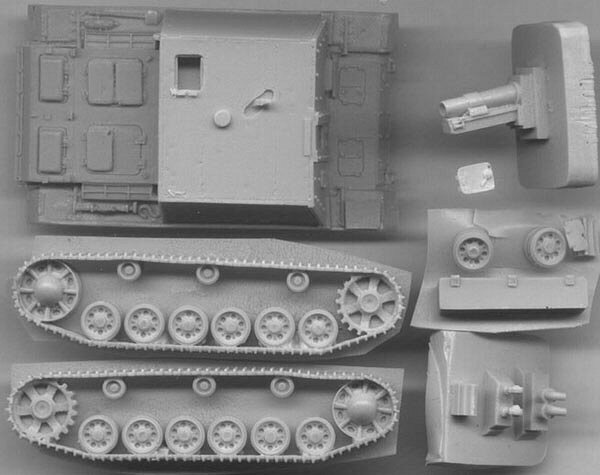 The specific changes made from the Stug for this conversion were not very accurate. The fighting compartment is much too massive. It is too tall, and the walls don't slope enough, so the roof is also too wide. The rooftop details are inaccurate; the gunsight cover is the wrong shape and in the wrong location, there is no ventilator, and the crew hatch is the wrong size, shape, and in the wrong location. The crew hatches on the rear wall are surprisingly correct. 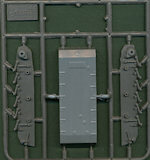 The engine transmission access hatches are the same fictitious hatches seen on the AMC kit. The engine deck was not changed from the F/8 pattern to the early layout, and is thus also incorrect. Many of the detail inaccuracies can be fixed, but it would take some serious grinding and sanding to correct the superstructure size and shape. But even so, if the superstructure details were corrected, and this model was placed in a setting by itself, i.e., not adjacent to another StuIG 33 kit to which comparisons could be made, then it could be a perfectly adequate representation of this vehicle. The most recent StuIG kit to hit the market, this is a limited-run plastic model. Although the accuracy is pretty good overall, the kit's molding quality isn't as good that exhibited by other limited-run kits. See a complete preview of the kit here. 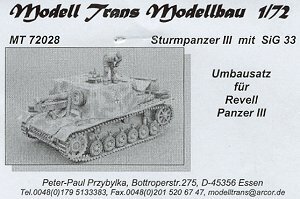 This conversion set was adapted from a Revell Panzer III hull, thus it is highly detailed with accurate dimensions. 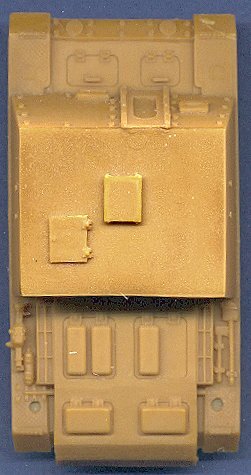 Unfortunately, the engine deck is unchanged from the Panzer III kit, so it has the incorrect F/8-style cooling vent arrangement. The fenders are mostly clean, with a small tool box added to the right front fender. The transmission access hatches have been altered to represent the early style with the single, heavy hinges. It is interesting that this change was made from the Revell kit, but not the engine deck. The new fighting compartment is masterfully done, with excellent dimensions and detail. The roof is completely accurate, with correct placement of the crew hatch and the ventilator. The gunsight cover is provided as a separate part. Unfortunately, the commander's hatch is molded closed. The hatches on the rear of the superstructure are also correctly shaped and placed, though unfortunately again, molded closed. 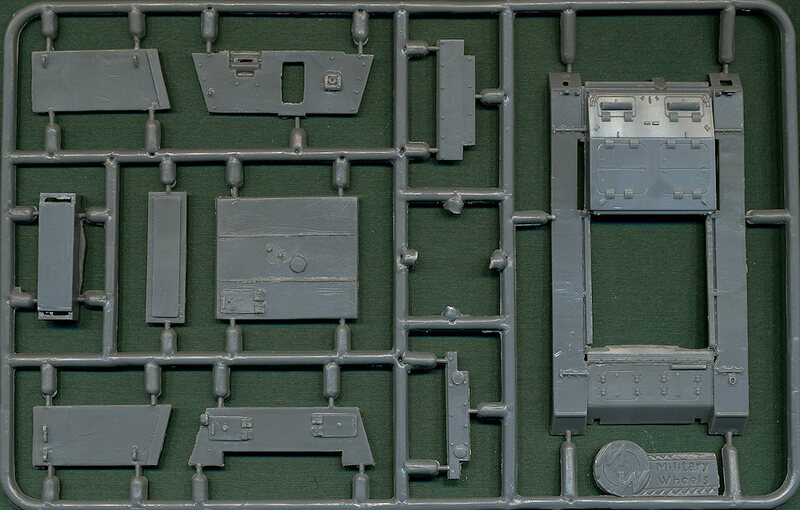 The other two parts in this set are the engine deck storage box and the main gun. Both of these parts are very detailed and accurately shaped. 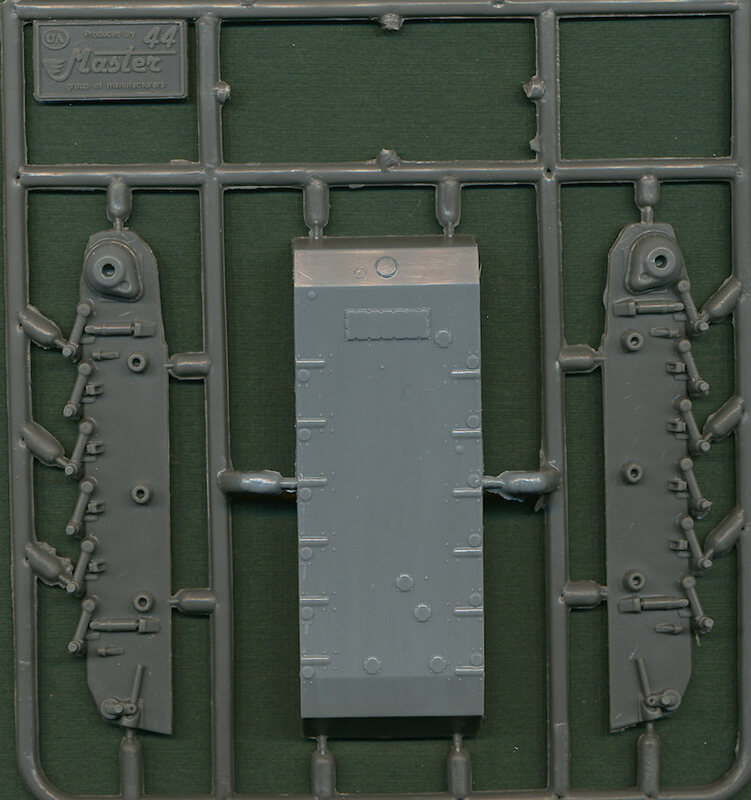 The hinged cover plate on the front face of the superstructure, beneath the gun is very well made. The machinegun opening is correctly placed and shaped. This kit does not include the armored plate for the lower glacis. This was my favorite conversion set in this review, until I realised that it has the wrong engine deck. 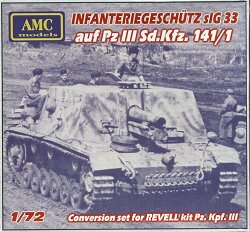 However, since this kit and the AMC kit (which has the correct engine deck, but nothing else) are both conversions of the Revell Panzer III, it will be a very simple task to swap the engine decks of the two conversions, to make a very accurate and detailed StuIG 33. This is one of the most accurate kits in this review, which is surprising considering that it was one of the first kits made available to us. It is a complete kit. 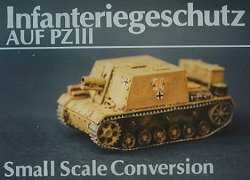 Based on the ESCI Stug III, the dimensions are good, with the exception of the fender length (a flaw common to all the conversions made from an ESCI kit). The engine deck was altered to represent the early version, and since the glacis access hatches are the late style, this indicates that this hull was originally from a Stug. III E or F. Most of the superstructure details are correct and nicely molded, with the exception of the ventilator being located a little too far aft. This kit correctly captures the look of the real tank, taking into account the size, location and 3-dimensional aspect of the bolts, armored plates, machinegun opening, etc. All crew hatches are unfortunately closed. If the fenders are not replaced completely, it would be a good idea to replace some of the molded-on tools, such as the shovel and the fire extinguisher, though the jack looks very good. 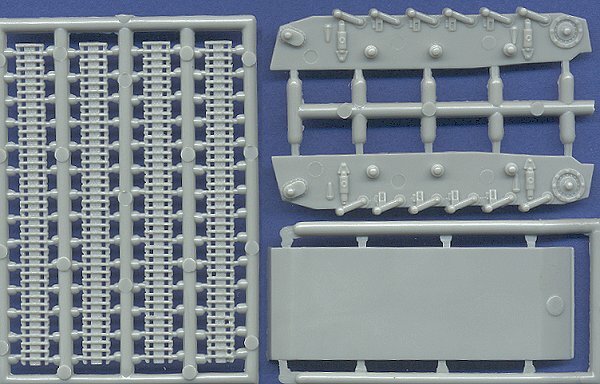 The wheels and tracks are molded together as a single piece, and depending on the quality of the casting you get, they may require some clean-up. In fact, the bottom surfaces of the model need extensive clean-up because of all the air bubbles present in the resin from being cast in an open top mold. The road wheels, sprocket wheels and tracks are copies of the ESCI parts, and look quite nice, but the real surprise with this kit is the style of idler wheel used. It is the very old style seen on early versions of the Panzer III and Stug III. When I first saw this, I wondered about its accuracy, but careful examination of the available photos has revealed a couple StuIGs with this wheel: one from the first batch captured by the Russians, and one from the second batch in southern Ukraine. There are two possible explanations for this wheel: 1) It may simply be a field replacement of a damaged idler, using an old spare wheel, or 2) the vehicles with these wheels may have been converted from very early Stugs, since the early idler was discontinued during the production run of the Stug. III Ausf C. But since this kit has the glacis access hatches of the later style (Ausf. E), only the first explanation would be valid here. If this StuIG had been converted from an Ausf. C or earlier, then it should have the early access hatches with the single, heavy hinges. All in all, I like this kit very much. I do not recognize the origin of this kit; perhaps it is an original. It certainly is not modified from either an ESCI or Revell kit, and considering some of TP's earlier models, it is possible that this one is actually based on a 1/76th scale kit, such as from Fujimi. However, the overall vehicle dimensions are only slightly smaller than they should be, and it fits in very well with the other kits considering its size. This is a complete kit, but unlike the other resin kits, the body is not solid. The lower hull is a single piece and mostly hollow. The superstructure is a single piece and again, mostly hollow. The commander's hatch and the gunsight opening in the rooftop armor plate are molded open, although they are incorrectly located. There is no ventilator. 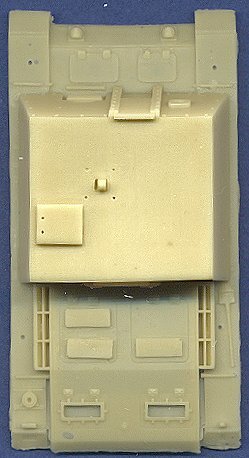 This is the only resin kit that would allow a modeler to easily add an interior. The crew hatches on the rear of the fighting compartment are incorrectly represented as a single, double-door hatch in the center of the rear wall. The engine deck is separate (and correct for the early version), but the engine bay is not open, which would have allowed the addition of an engine. There is nothing molded on the fenders except braces, which is a nice touch. The glacis access hatches have the early style hinges. This kit is typical of TP's other models in that there are a large number of small parts, making this a fun kit to build, but the molding is not to the high quality of the other manufacturers. The surface texture is very rough and uneven, the detail on many parts is soft, and there are numerous bubbles. But I very much like the detail on the wheels and tracks. Instructions are pretty much non-existant, with the same four-view line drawing included in the AMC kit, which shows the vehicle number as "64" when it should be "G4". I'm not sure who copied from whom here. When I first got this kit, I was rather put off by the poor resin quality, but after looking at it carefully and considering it's accuracies and inaccuracies, it is actually one of the better kits in this review, albeit with poor casting. I like the options it includes as a complete kit with hollow hull, and with some careful clean-up and scratchbuilding, it could probably result in a very nice model. I have not seen this kit in hand, only some photos of a completed model. I have it on good assurances from the model builder that this kit is indeed 1/76th scale, and likely converted from a Fujimi Panzer III or Stug III kit. If anybody else any additional information on this kit, please let me know.